Not to be confused with New American Bible or American Standard Version. NT: Novum Testamentum Graece. OT: Biblia Hebraica Stuttgartensia with Septuagint influence. In parallel with the bible itself, the NAS Exhaustive Concordance of the Bible was published in August 1997. For convenience, this Concordance uses the same word numbering system as Strong's Concordance. The NASB is a revision of the American Standard Version (ASV) of 1901 and offers an alternative to the Revised Standard Version (1946–1952/1971), also a revision of the ASV, which is considered by some to be theologically liberal. The Hebrew text used for this translation was the third edition of Rudolf Kittel's Biblia Hebraica as well as the Dead Sea Scrolls. The Biblia Hebraica Stuttgartensia was consulted for the 1995 revision. For Greek, Eberhard Nestle's Novum Testamentum Graece was used; the 23rd edition in the 1971 original, and the 26th in the 1995 revision. In 1992, the Lockman Foundation commissioned a limited revision of the NASB. In 1995, the Lockman Foundation reissued the NASB text as the NASB Updated Edition (more commonly, the Updated NASB or NASB95). Since then, it has become widely known as simply the "NASB", supplanting the 1977 text in current printings, save for a few (Thompson Chain Reference Bibles, Open Bibles, Key Word Study Bibles, et al.). In the updated NASB, consideration was given to the latest available manuscripts with an emphasis on determining the best Greek text. Primarily, the 26th edition of Nestle-Aland’s Novum Testamentum Graece is closely followed. The Biblia Hebraica Stuttgartensia is also employed together with the most recent light from lexicography, cognate languages, and the Dead Sea Scrolls. The updated NASB represents recommended revisions and refinements, and incorporates thorough research based on current English usage. Vocabulary, grammar, and sentence structure were meticulously revised for greater understanding and smoother reading, hence increasing clarity and readability. Terms found in Elizabethan English such as "thy" and "thou" have been modernized, while verses with difficult word ordering are restructured. Punctuation and paragraphing have been formatted for modernization, and verbs with multiple meanings have been updated to better account for their contextual usage. YHWH (rendered as "Jehovah" in the original A.S.V.) is rendered LORD or GOD in capital letters in the NASB. The committee stated the reason as: "This name has not been pronounced by the Jews because of reverence for the great sacredness of the divine name. Therefore it has been consistently translated LORD. The only exception is when it occurs in immediate proximity to the word Lord, that is, Adonai. In that case it is regularly translated GOD in order to avoid confusion. It is known that for many years YHWH has been transliterated as Yahweh, however no complete certainty attaches to this pronunciation." This is in direct contrast to the preface of ASV of 70 years earlier, where the committee explained that "the American Revisers...were brought to the unanimous conviction that a Jewish superstition, which regarded the Divine Name as too sacred to be uttered, ought no longer to dominate in the English or any other version of the Old Testament." The foundation's Web site indicates that among the translators and consultants who contributed are conservative Bible scholars with doctorates in biblical languages, theology, "or other advanced degrees", and come from a variety of denominational backgrounds. More than 20 individuals worked on modernizing the NASB in accord with the most recent research. ↑ "The New American Standard Bible". The Most Literal is Now More Readable. The Lockman Foundation. Retrieved December 14, 2007. ↑ "Permission to Quote Copyright & Trademark Information". The Lockman Foundation. Retrieved December 14, 2007. ↑ Pope, Christopher. "Comparing Bible Translations: Conclusions" (PDF). Retrieved May 21, 2013. ↑ "The Lockman Foundation - NASB, Amplified, LBLA, and NBLH Bibles". Lockman.org. Retrieved February 16, 2012. 1 2 "NASB Translation Principles". lockman.org. Retrieved December 2, 2015. ↑ Harris, R. Laird (1969). "Inspiration and Canonicity of the Bible: An Historical and Exegetical Study". Contemporary Evangelical Perspectives (2nd ed.). Grand Rapids: Zondervan. p. 58. 1 2 "Preface". Retrieved August 9, 2010. ↑ "Why the NASB?". The Lockman Foundation. Retrieved June 16, 2009. 1 2 3 "New American Standard Bible". The Lockman Foundation. Retrieved June 16, 2009. 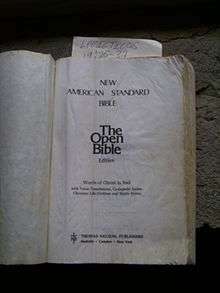 ↑ Holy Bible: New American Standard Bible (NASB 1977 Edition). Books.google.com. Retrieved February 16, 2012. ↑ "Preface to the American edition". Retrieved August 9, 2010. ↑ BeDuhn, Jason David (2003). Truth in Translation -- Accuracy and Bias in English Translations of the New Testament. University Press of America. p. 35,39. ISBN 978-0761825562. 1 2 "The Lockman Foundation - NASB, Amplified Bible, LBLA, and NBLH Bibles". The Lockman Foundation. Marlowe, Michael D. (Oct 2002). "New American Standard Bible". Retrieved March 19, 2005. The Lockman Foundation (1995). "Preface to the New American Standard Bible". Retrieved March 19, 2005. The Lockman Foundation. 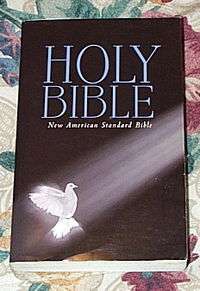 "New American Standard Bible". Retrieved April 13, 2006. The Lockman Foundation. "Translation Principles". Retrieved April 13, 2006.